MamaBreak: MUM+BUB hair and body wash and ultra gentle lotion Review! MUM+BUB hair and body wash and ultra gentle lotion Review! We got some amazing gifts for baby boy #2 from aden+anais. We LOVE their blankets, so when I was able to try out their new bath and skin care line, I was really excited. 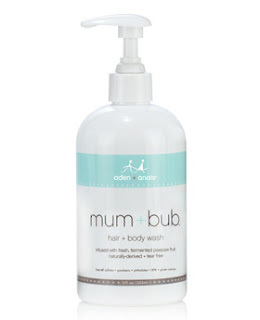 We tried the mum+bub Hair and Body Wash and the Lotion. I really wanted the BEST for my newborns skin, and these two products were awesome. Made from paw-paw fruit and scented with Australian Sandalwood, this mild yet moisturizing wash was great for our first days with baby boy :) We also have a 3 year old in the house, and nothing new goes un-noticed by him! He squirted about 10 pumps into the tub for his bath time and loved it too. Since it's tear-free, its great for both my little "bubs."! The lotion is great too! Me and baby were able to use it in the hospital! It has paw-paw fruit, Shea butter and that yummy Australian Sandalwood scent! We love it SO much because it does NOT have parabens, petroleum oils, or gluten. Mama and babe in the hospital, an hour after birth!